good people find themselves in conflict? 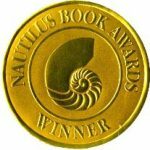 The Nautilus Book Awards recognize books that make exceptional literary contributions to conscious living & green values, high-level wellness, positive social change, and spiritual growth. 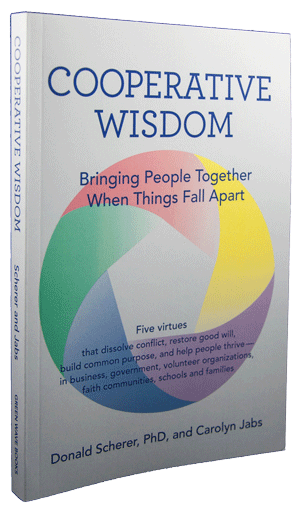 Cooperative Wisdom wins praise from Kirkus Reviews. Favorite quote: Scherer’s words are empathetic, compelling, and frequently pithy, as when he refers to the practices for each virtue as “exercises…that expand our moral range of motion.” A scholarly self-help book with sage guidance and real-life examples of “cooperative wisdom” in action. Cooperative Wisdom introduces an innovative approach to conflict that consistently restores cooperation in families, workplaces and communities. Written as a spirited exchange between an acclaimed ethicist and an inquisitive journalist, the book introduces five social virtues that crack open stubborn problems and reveal cooperative solutions. Using lively examples from history, current events, family life, even scripture, Cooperative Wisdom equips readers to transcend conflicts and strengthen the communities on which human happiness depends. Intentional imagination expands our sense of what’s possible.